NOTE: The above installation guide is for HDF 1.2.0.1, this is the version that matches Apache MiNiFi 0.0.1. Although HDF 2.0 may work, for this exercise -- it is not recommended at this time. 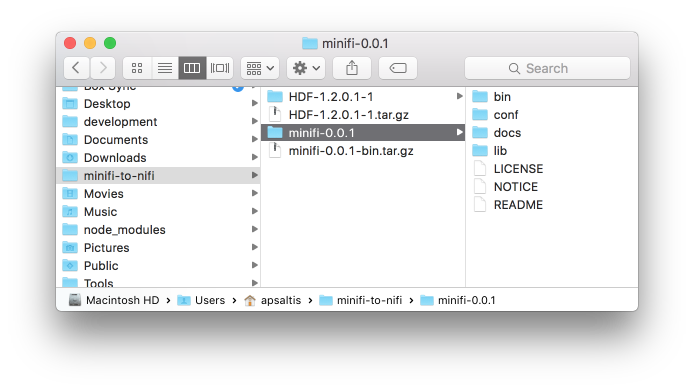 Now that you have NiFi up and running it is time to download and install MiNiFi. Open a browser. 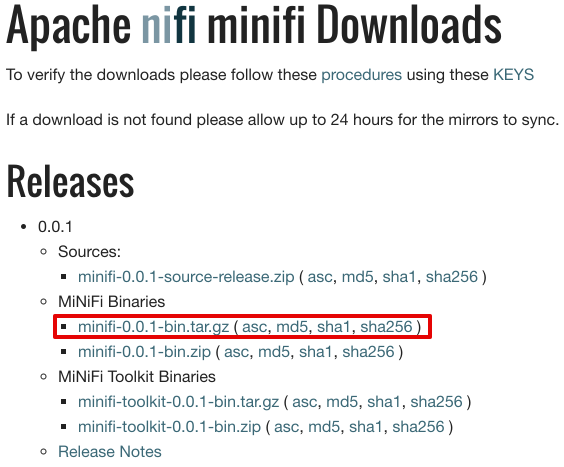 Download the MiNiFi Binaries from Apache MiNiFi Downloads Page. There are two options: tar.gz a format tailored to Linux and a zip file more compatible with Windows. If you are using a Mac either option is just fine. nifi.remote.input.socket.host=localhost <-- This is only being done for this exercise as MiNiFi and NiFi are running on the same host. This is not a recommended way of deploying the two products. nifi.remote.input.secure=false <-- This implies we are only using HTTP and are not securing the communication between MiNiFi and NiFi. For this exercise that is OK, however, it is important to consider your security needs when deploying these technologies. The first thing we are going to do is setup an Input Port. This is the port that MiNiFi will be sending data to. 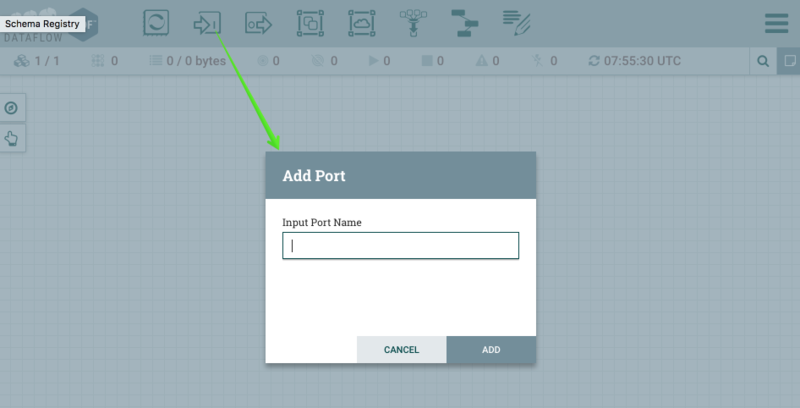 To do this drag the Input Port icon to the canvas and call it "From MiNiFi" as show below in figure 3. Now that the Input Port is configured we need to have somewhere for the data to go once we receive it. In this case we will keep it very simple and just log the attributes. To do this drag the Processor icon to the canvas and choose the LogAttribute processor as shown below in figure 4. Now that we have the input port and the processor to handle our data, we need to connect them. 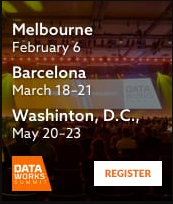 After creating the connection your data flow should look like figure 5 below. Your canvas should now look similar to what is shown below in figure 8. 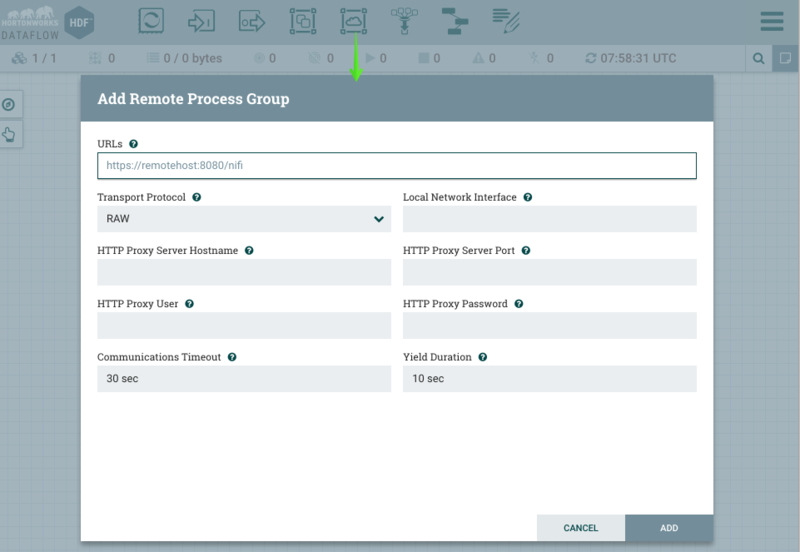 Right-click on the "From MiNiFi" connection and choose "Configure"
Set the "Back pressure object threshold" and "Back pressure data size threshold" to 10000 and 1 GB respectively. We now need to save our template, as illustrated below in figure 10. Next copy the config.yml to the minifi-0.0.1/conf directory. That is the file that MiNiFi uses to generate the nifi.properties file and the flow.xml.gz for MiNiFi. 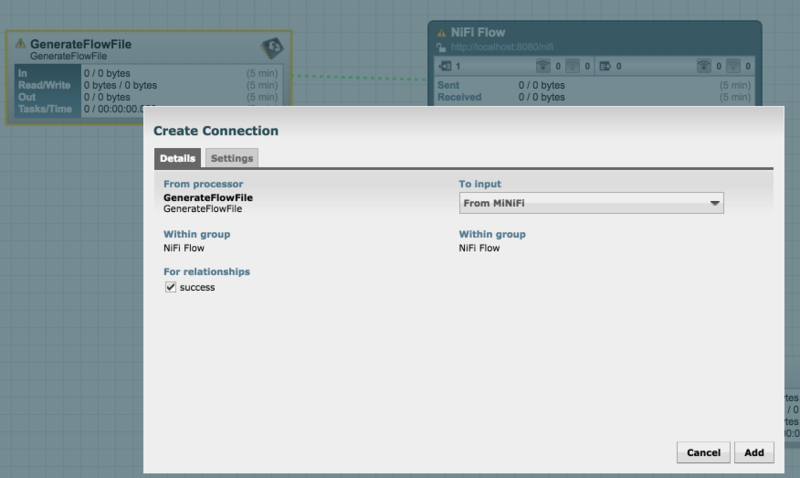 You should be able to now go to your NiFi flow and see data coming in from MiNiFi. 2. I would never recommend setting nifi.remote.input.socket.host= to "localhost". When a NiFi or MiNiFi connects to another NiFi via S2S, the destination NiFi will return the value set for this property along with the value set for nifi.remote.input.socket.port=. In your example that means the source MiNiFi would then try to send FlowFiles to localhost:10000. This is ONLY going to work if the destination NIFi is located on the same server as MiNiFi. 3. You should also explain why you are changing nifi.remote.input.secure= from true to false. Changing this is not a requirement of MiNiFi, it is simply a matter of preference (If set to true, both MiNiFi (source) and NiFi (destination) must be setup to run securely over https). In your example you are working with http only. 4. While doable, one should never route the "success" relationship from any processor back on to itself. If you have reached the end of your dataflow, you should auto-terminate the "success" relationship. 6. When using the GenerateFlowFile processor in an example flow it is important to recommend that user set a run schedule other then "0 sec". Since MiNiFi is Apache 0.6.1 based there is no default backpressure on connections and with a run schedule of "0 sec" it is very likely this processor will produce FlowFiles much faster then they can be sent across S2S. This will eventual fill the hard drive of the system running MiNiFi. An even better recommendation would be to make sure they set back pressure between the GenerateFlowFile processor and the Remote Process Group (RPG). That way even if someone stops the NiFi and not the MiNiFi they don't fill their MiNiFI hard drive. Thanks for the feedback @mclark all of your suggestions should now be apparent in the content. Thanks again for the input. @Roger Young -- You are correct once the template is downloaded you should be able to delete it and the related part of the flow. 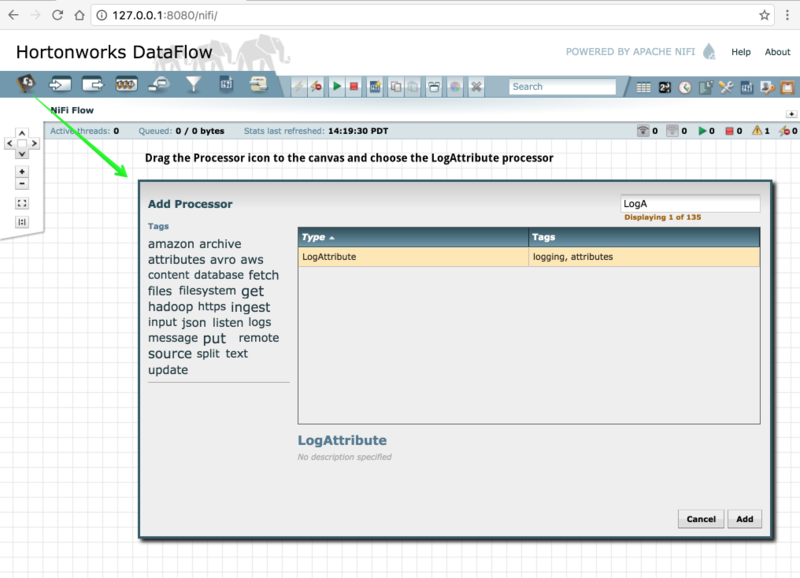 I am not sure off-hand why you are not seeing data flow form MiNiFi. I am actually using this exercise in a class I am teaching today and will be sure to test this and see what happens. What version of MiNiFi and NiFi are you using? hi, i am using nifi-1.2.0 and minifi-0.2.0. Thanks for the useful tutorial Marc! I am not able to move beyond step 6. After creating the remote process group, I am getting an error 'http://127.0.0.1:8080/nifi' does not have any input ports.